The common 'plough' block eye style, with the 'wire' bit removed. The 'Scotch Pattern' eyeblock winkers, showing the 'wire' bit. 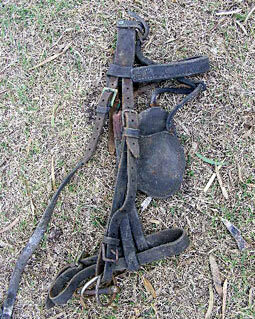 These have been ornamented for show purposes, but were made in Scotland circa 1904 as part of a set of pair show plough harness. and was the common style of jointed bit on many old winkers. 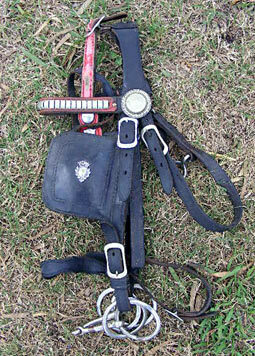 A 'delivery' style of winkers, with square eye blocks and ornaments for the show ring. 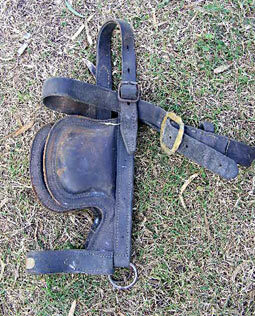 This bit is a two-ring Wilson snaffle. 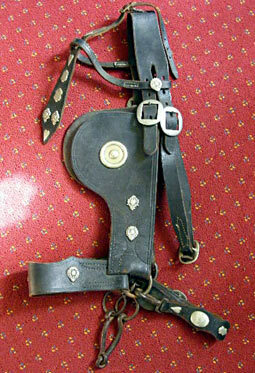 A small pair of 'hatchet-eye' style winkers suitable for a sulky pony or light horse.